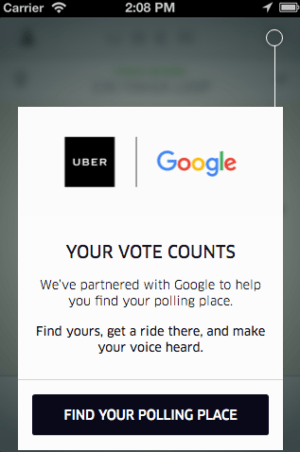 Election Day is only days away, and Uber and Google have teamed up to help voters cast ballots. As part of its ongoing campaign to boost the turnout among Uber users, the San Francisco-based ride-sharing service has worked with Google a special in-app feature available Nov. 8 that will help locate polling locations – and quickly request a ride with a simple tap on the smartphone. 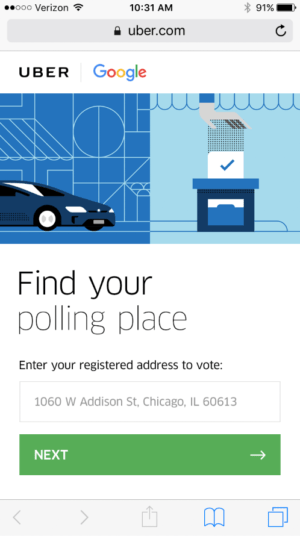 On Election Day, Uber users will see a reminder to get out and vote; the unique feature will let them enter the address where they are registered, helping to locate the appropriate polling sites by hitting the “Find Your Polling Place” before requesting a ride. New Uber users riding for the first time can enter the code VOTETODAY for $20 off. Unlike other Uber promotions, trips will be subject to standard charges, with no free or discounted rides for existing users on Election Day.